One run is the production of several Jumbo rolls, of the same type of paper and same basis weight. These Jumbos rolls are cut in the rewinder into reels of different widths according to the orders. 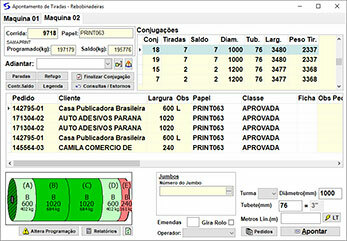 In the planning module, the sequence of runs is set for each paper machine. As new orders are inserted in a run, it’s duration is increased to match the new amount. 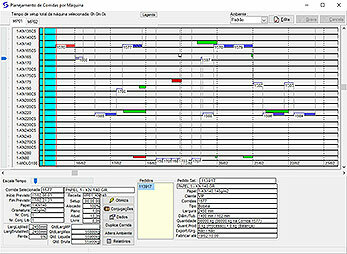 The planning module graphically displays the runs and the orders. Orders are clearly identified if they are scheduled according to their due dates. The setup of the paper machines considers the changes in type of paper, basis weight or felt type are considered in TrimPaper. Run sequence in “zigzag”, that is, increasing the weight gradually until reaching the maximum and decreasing it until reaching the minimum, demand smaller set-up times. 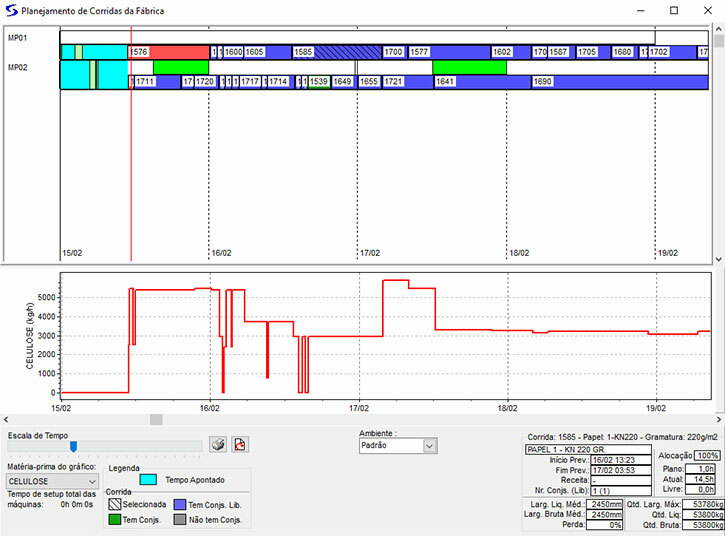 TrimPaper allows simulations of run sequences facilitating the production programmer analysis. The interaction between the paper machines is also addressed. Steam consumption and liquid pulp flow, for example, can become bottleneck if the machines are producing high basis weights. TrimPaper displays the consumption of the inputs for all paper machines. It’s the most complex TrimPaper module, which has been continuously improved since 1988. The optimizer internally creates a system of equations and variables and solves them in a few seconds. As all cutting possibilities are analyzed, it is guaranteed that the optimal solution will always be obtained. Therefore, no other software neither any experienced programmer will get better results. Cutting patterns are the ways to cut jumbo rolls into rools of smaller widths. If a cutting pattern does not reach the maximum width of the machine, there will be a loss called trim loss. The optimizer determines which cutting patterns should be used in ordet to minimiza the trim losses. The algorithm examines whether anticipating orders will reduce losses. However, the gain in loss reduction will be compared to the cost of capital tied to the paper stock and the most economical solution will be chosen. The auxiliary rewinder, which cuts the rolls of the main rewinder into narrower rolls or smaller diameter, is also treated. As with sheets , TrimPaper minimizes the cost of the auxiliary rewinder. TrimPaper can simultaneously optimize hundreds of orders. TrimPaper tracks each roll. It stores the manufacturing date, quality and process control tests, machines and operators of each Jumbo roll and identifies that Jumbo was used in the production of each roll. When the production programmer accepts a run, the cutting patterns are transferred to the production module. A computer on the rewinder receives the cutting patterns and the information abou how much should be produced. During production, we can see the difference between the programmed and the actual realized, with the actual weight of the produced coils and rejected coils. 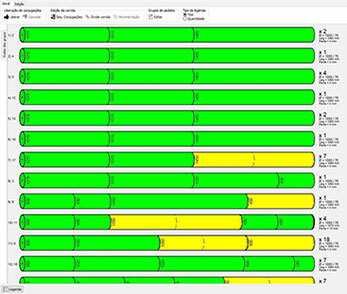 TrimPaper guides the rewinder operator, in real time, about increasing or not the number of sets and associates theJumbo rolls to orders, including their quality tests. The TrimPaper can be connected to digital scales that have electronic interface, capturing the weight automatically. TrimPaper programs and controls the production of sheets in reams and skids when they are packed in automatic machines and also when they are manually packed. 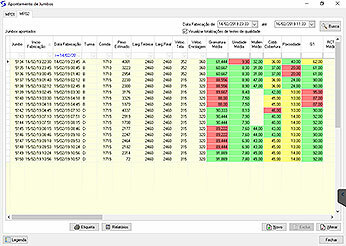 TrimPaper stores all quantitative and visual tests of the rolls and issues the technical reports. With TrimPaper you can consult the history of tests, classifying them by machine, paper grade, production date or by production order. The tests are shown graphically: Gaussian curve, mean, standard deviation and confidence interval. The tests can be exported to Excel spreadsheets or statistical software.